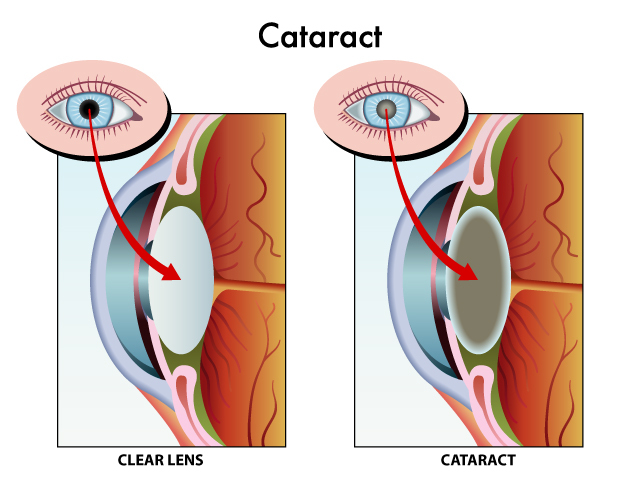 A cataract is a gradual clouding of the natural lens inside the eye. All light that enters the eye must pass through the lens to focus on the retina. As the lens becomes cloudy, the light gets scattered, or in severe cataracts completely blocked. The scattering of light creates a cloudy image similar to looking through a frosted window. Most cataracts develop slowly over time. However, there are certain types of cataracts that can advance quite rapidly. 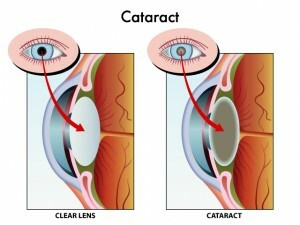 If cataracts are mild, usually no treatment is necessary. However, once the cataract becomes sufficiently cloudy, adjusting glasses no longer helps clear the vision. At this point, the only treatment is cataract surgery to remove the cloudy lens and replace it with a clear artificial lens. Modern cataract surgery is an extremely safe and effective treatment. In fact, it is the most commonly performed surgery in America today. Through modern technology, cataract surgery is much faster and less invasive than in the past. The surgery involves making a very small incision through the clear cornea in the front of the eye. 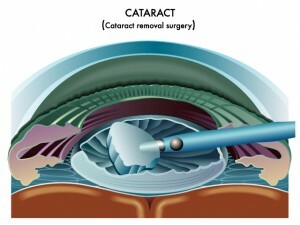 A special instrument is then used to break the cataract into pieces and remove it. The capsule that surrounds the natural lens is left in place and serves as the scaffolding to hold the artificial lens in position. The artificial lens is then inserted into the eye and sits inside this capsule. In this way, the new lens does not have to be sutured in place. The incisions are small enough that they usually do not require suturing. Will I have to wear glasses after? Glasses are used to correct two major conditions that affect visual clarity. First, glasses can be used to correct near-sightedness (myopia) or far-sightedness (hyperopia). This has to do with the overall focusing power of the eye. If the eye focuses light in front of the retina, this results in myopia. If the eye focuses light behind the retina, this causes hyperopia. Prior to cataract surgery, measurements are taken of the size, shape, and length of the eye as well as its focusing power. With these measurements, we are able to select the correct artificial lens for implantation which will greatly reduce or eliminate myopia or hyperopia. This results in good distance vision without glasses in most cases. However, in order to see up close, reading glasses will be required. The other condition that glasses are able to correct is called astigmatism. Astigmatism refers to the shape of the cornea or the clear window on the front of the eye. An ideal cornea would be perfectly round, causing light hitting on any spot on the cornea to focus on the same fine spot on the retina. However, most people have some amount of distortion in their cornea. Rather than the cornea being round like a basketball, most people have a cornea shaped more like a football. This causes light to be focused at different locations and results in a blurry image. Glasses can correct astigmatism by creating a lens which counteracts the irregular shape of the cornea. Astigmatism can be corrected during the cataract surgery as well. During the surgery, the surgeon can make special incisions on the cornea to help minimize post-operative astigmatism. This will help to minimize the need for distance glasses after surgery. However, if the amount of astigmatism is large, incisions alone will not be able to fully correct the problem. In these cases, a special astigmatism-correcting (toric) artificial lens can be implanted. This is the best choice for anyone with astigmatism who wants to minimize the need for distance glasses after surgery. This toric lens is considered a premium lens, and its additional cost is not covered by most insurance companies. What options are available for the implantable lens? The standard lens implanted after cataract surgery is called a monofocal lens. This lens is able to focus light at one distance. It is able to correct near-sightedness or far-sightedness. Most patients who select this lens opt to have it focused for good distance vision. With a monofocal lens, reading glasses are generally required for near work. For patients with astigmatism, an astigmatism-correcting (toric) lens can be implanted. If a patient has significant astigmatism and a standard lens is implanted, the astigmatism will still need to be corrected with glasses after surgery. This will result in a need for glasses at both distance and near after surgery. If the patient’s goal is to minimize the need for glasses after cataract surgery, a toric lens should be considered. Individualized toric lenses can be placed to treat the amount and location of astigmatism for each patient. A toric lens can result in good post-operative distance vision without glasses. However, readers will still need to be used for near work. A third option is a multifocal lens. The multifocal lens is designed to provide the greatest degree of freedom from glasses. A multifocal lens focuses light from multiple distances: near, intermediate, and distance. 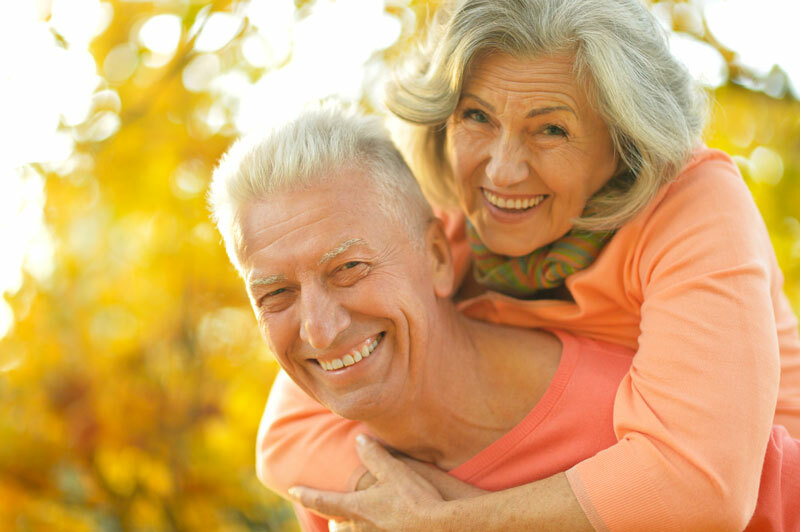 With a multifocal lens implant, the majority of patients are able to be completely glasses free for all activities. At Southern Idaho Ophthalmology, we use the RESTOR multifocal IOL from Alcon or the Tecnis multifocal IOL from Abbott. Please click on the following links to read more about each of these lenses. Do cataracts ever grow back? No, the cataract itself does not ever grow back and you will never have to undergo cataract surgery a second time on the same eye. However, occasionally the natural clear capsule that holds the lens in place can become cloudy after surgery. If this occurs, the vision will become blurry, similar to the symptoms from a cataract. If this occurs, the cloudy membrane can be easily removed using a YAG laser. This is a simple in-office procedure that only takes a few minutes and generally requires no post-operative care. Once this is performed, it will never have to be repeated.